For Busy Moms Ready to Ditch Dieting & Transform Your Relationship with Food! I created this course to show you that there is another way of eating that is actually nourishing and enjoyable. It is possible to listen to your body and see food as medicine and pleasure. This is an approach that goes against everything you may have learned from dieting industry. Isn't mindful eating just another diet? Mindful eating is just about being present while you eat - How can there be a course on something so simple? None of the above is true. 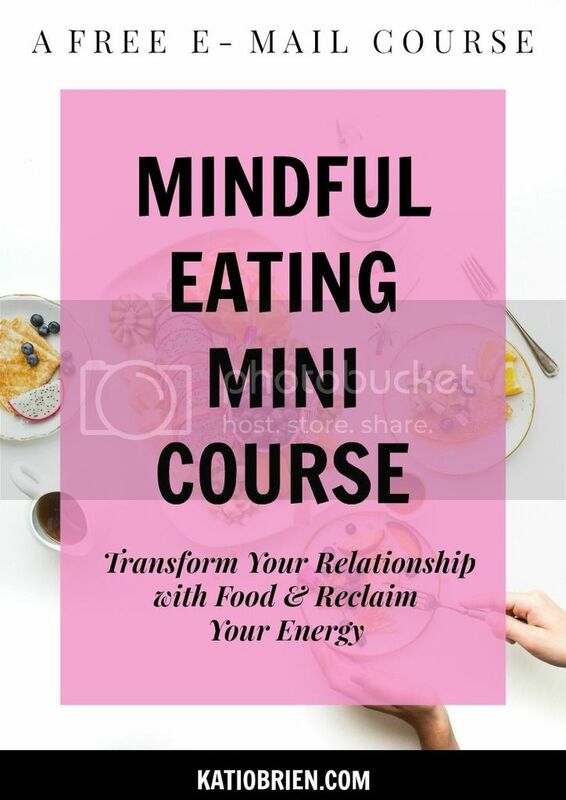 And this course will help you to understand that there is a lot more to Mindful Eating than you think, but anyone can do it, even without willpower or self-control. THIS IS A FREE 5-DAY EMAIL COURSE THAT SHOWS YOU HOW TO START EATING MINDFULLY AND TRANSFORM YOUR RELATIONSHIP WITH FOOD. EACH DAY FOR 5 DAYS YOU'LL RECEIVE A NEW LESSON RIGHT TO YOUR INBOX. This isn't going to be a course full of information for you to consume and not put into practice. This course is all about taking action. It's not going to be for everyone. This email course is for moms ready to commit to creating lasting healthy habits and start eating in a way that feels nourishing and enjoyable. This course is for you if you're ready to stop falling victim to the diet industry and start taking responsibility for your HEALTH and WELLNESS. Hi there! I'm Kati. I'm a holistic health and wellness coach that specializes in helping mothers nourish their mind and body, make peace with food, and start living the life they truly crave. I've struggled with dieting, emotional eating, and sugar cravings for years. I love to share my tips for how I transformed the way I eat (and live) and how you can too! If you have any questions or would like to work with me, don't hesitate to send me an e-mail at hello@katiobrien.com. The course starts now! You will receive a Welcome e-mail today followed by the first lesson tomorrow. How does lifetime access sound? Once you will enroll, you will receive all of the e-mails in your inbox and you'll be able to save them and come back to them in the future. Get this 5-day e-mail course for free, and learn how Mindful Eating can transform your relationship with food!